BJP emerged as the single largest party in Karnataka with 104 seats. Meanwhile, Congress and JD(S) have joined hands to pip BJP with a combined seat tally of 115, crossing the halfway mark of 112 seats. Despite the spirited contest, no single party could make it to the halfway mark of 112 seats in Karnataka. As per Karnataka election results, Bharatiya Janata Party emerged as the single largest party in the state with 104 seats in its kitty. Meanwhile, Congress and Janata Dal (Secular) have joined hands to pip BJP with a combined seat tally of 115, giving them a strong chance of proving majority on the House floor when the time comes. Amidst all this, the power to decide the fate of these contenders now rests with Karnataka Governor Vajubhai Vala. Escalating the suspense in the scheme of things, Vala has declared that he will take a call on who to invite to form the next government in Karnataka only after Election Commission comes out with their final numbers. Meanwhile, both factions - BJP as well as Congress-JD(S) alliance has presented their claims to power before the Governor. Senior Congress leader Ghulam Nabi Azad, who was sent to Karntaka to deal with the situation, reached out to JD(S) chief HD Deve Gowda on behalf of Sonia Gandhi. Azad met the former Prime Minister with the proposal of support from outside and the Chief Minister's office for his son HD Kumaraswamy. "We have had a telephonic talk with both Deve Gowda and Kumaraswamy. They have accepted that JD(S) will head the government," Azad said. Kumaraswamy, with Azad and outgoing Karnataka CM Siddaramaiah in town, met Governor Vajubhai Vala and staked the claim to form the government. Congress has secured 78 seats in the Karnataka elections 2018, whereas JD(S) has been victorious in 37 seats. With one independent candidate extending support, the post-poll alliance has a seat tally of 116. The halfway mark in the Karnataka Assembly is 112. According to India Today TV sources, Congress is likely to get 20 cabinet seats while JD(S) wants 14. The Congress will get deputy chief minister's post. Both the parties have decided to fight the 2019 Lok Sabha election in the state together. Former CM Siddaramaiah told reporters outside the Karnataka Raj Bhavan that the Congress-JD (S) alliance will provide a strong and a stable government. "We have the support of all the winning members from both the parties and we have presented a letter to the Governor regarding the same," Siddaramaiah said. The political twist spoilt the celebrations of BJP cadres on the emergence of the BJP as the single largest party. However, BJP is leaving no stone unturned to stake the claim to form the next government. Following his meeting with the Governor, the BJP CM candidate Yeddyurappa said they will prove the majority on the floor of the house. Following the statements made by the Congress and the JD(S) on their plan to stake claim to form the next government in Karnataka, BJP CM candidate BS Yeddyurappa cancelled his visit to Delhi. Senior party leaders Prakash Javadekar, JP Nadda, and Dharmendra Pradhan have also been rushed to Karnataka by BJP chief Amit Shah to explore routes to power in the state. According to India Today TV sources, BJP is in touch with half a dozen Lingayat leaders of the Congress and these Lingayat leaders will abstain on grounds of Siddaramaih insulting Lingayats. Siddaramaiah, while addressing the media after tendering his resignation, claimed that the BJP might try to poach Congress's MLAs. 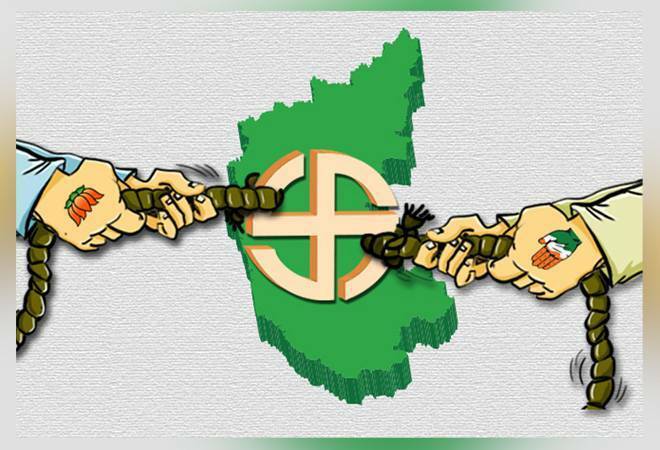 According to sources, JD (S) may shift its MLAs outside Banglore to keep the flock together. "We are taking care to make sure our MLAs are not poached," chief ministerial candidate HD Kumaraswamy told reporters.